The Winslow lab barcoding library consists of 96 retroviral plasmids, each with a unique 6 nucleotide barcode. This collection can be used for in vivo phenotypic screening of small-molecule libraries and can be combined with high-throughput sequencing to perform multiplexed analysis of compound pretreated cells. An in vivo multiplexed small-molecule screening platform. Grüner BM, Schulze CJ, Yang D, Ogasawara D, Dix MM, Rogers ZN, Chuang CH, McFarland CD, Chiou SH, Brown JM, Cravatt BF, Bogyo M, Winslow MM. Nat Methods. 2016 Sep 12.; doi: 10.1038/nmeth.3992. PubMed PMID: 27617390. 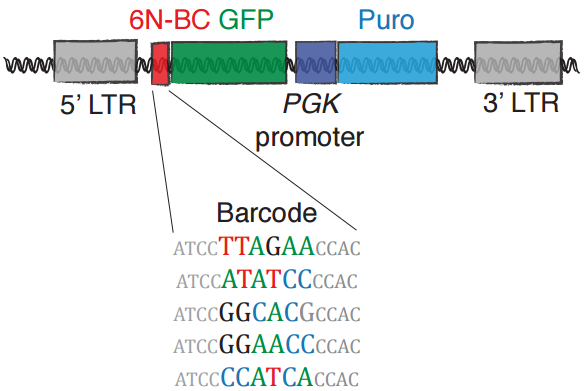 Example schematic of 6-nucleotide barcode system. Vector backbone is retroviral MSCV-BC-GFP/Puro. Supplemental Figure 1G. Reprinted by permission from Macmillan Publishers Ltd: Nature Methods Grüner and Schulze et al., copyright 2016.